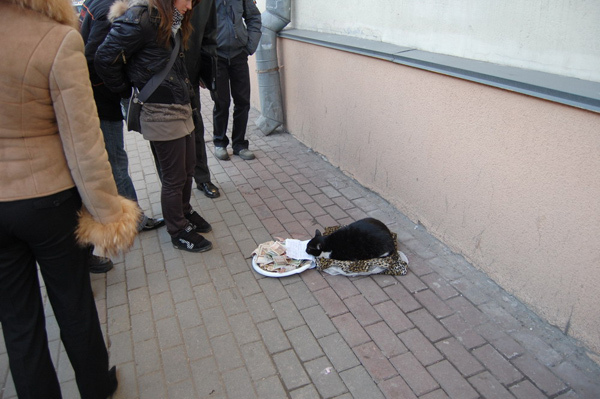 This cat begging money was spotted in one of the cities of Belarus. He stays on one place with a note that reads “need money for meat and fish, bless you”. He doesn’t leave his place and protects the money just with his sight. His owner was found nearby. It was an old lady. She told the story that she had rescued the cat from the slaughters, but at that time she had already owned some pets and couldn’t feed them all, so he decided to let the pets earn the money for themselves. Nothing will stay Miss India from her regularly appointed rounds of “OMG!” . All these people and their endless OMG… get a life, donate to the poor, and stop writing nonsense on forums. The cat is very cute… I would donate if I lived nearby. I’ve seen homeless with pets (cats and dogs) begging downtown San Francisco. People should not give money to these animal beggers, as they will not enjoy from it. Still if you wanna give something just buy a can of whiskas or something. The money only goes to the mafia. This cat is part of my good friend President Lukashenko’s plan to “humanize” the image of Belarus by showing its people being kind to animals, and vice versa. Meanwhile, Ling Chow Soon, owner of the best Chinese restaurant in Belarus, is upset about the plan and has written Lukashenko in protest, claiming the new “be kind to animals to impress the Westerners” is cutting into his supply of meat for his restaurant. No word yet on how Lukashenko will balance these competing interests, but the recent placement of a sheep in every single Belarussian male’s bedroom in several touristic villages does not look good for the meat market. What would be an estimate of that pile of money in Bucks, Euros, or Pounds? I know what you are thinking, but please, don’t try it. 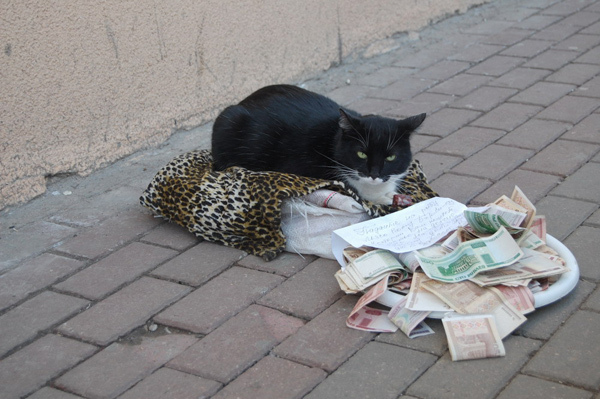 I know that pile of money is whispering to you, tempting you to take it, but be warned – that cat has a demon in his eyes. He will leap up from his bed and sink his claws into your testicular pouch and rip it like a cheap Chinese paper table cloth, and sink his teeth into your penie as if it is a fresh sausage. There is not a plastic surgeon in all of Hollywood who could repair such damage. Based on the above information, I recommend you keep walking and don’t look back. I think the green one maybe a 100BYR and some of the others maybe 50’s. 100BYR as of today is worth around 2.5 British pence. However in 2000 they introduced new ruble notes that were exchanged at at rate of 1 new ruble to 1000 old rubles. So some of those bundles of notes could be the old ones and not even amount to a penny for the lot..
2 Russian cat: you attempt to compete with Belorusian collegues ? [on pics, above]. He’s just gonna use it to buy more catnip! What money are there? Definitely not Russian. Ukrainian? It’s Belarusian rubles. And Belarus isn’t part of Russia lol. You guys should learn geography.. Because Belarus != Russia.. This cat is well known pimp. he is prostituting this old lady. I can tell you the old lady is worth it, she has not teeth. This cat has strong pimp-paw. this is not Russia! simply because the money is not Russian! But how??? Both are called russians! Russian and Russians are best in the world. Usually when i see a blog i read through it and move on, however this one was trully a great one, i thought i would take the time to give you thanks for such a delightful blog post. OMG russians cats are so poor! Shouldn’t his human be lying on an old coat on the floor nex to him looking doleful? 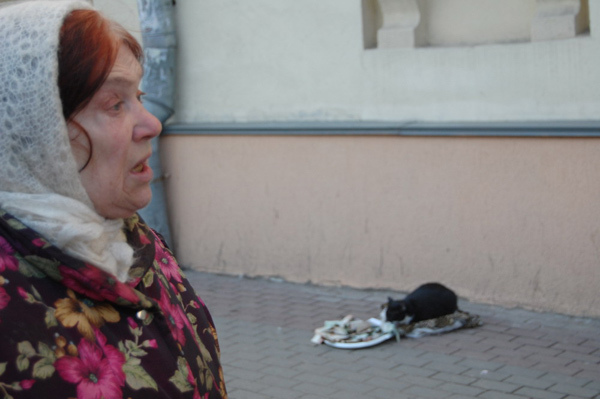 This cat begging money was spotted in one of the cities of Belarus. He stays on one place with a note that reads “need money for meat and fish, bless you”. He doesn’t leave his place and protects the money just with his sight…. smart cat. copy cat. smart.